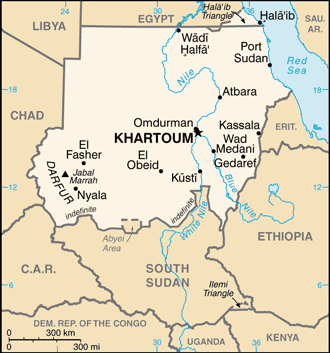 Sudan (Arabic: السودان‎ as-Sūdān Listeni/suːˈdæn/ or /suːˈdɑːn/;), officially the Republic of the Sudan (Arabic: جمهورية السودان‎ Jumhūrīyat as-Sūdān) and sometimes called North Sudan, is an Arab state in the Middle East and North Africa bordered by Egypt to the north, the Red Sea to the northeast, Eritrea and Ethiopia to the east, South Sudan to the south, the Central African Republic to the southwest, Chad to the west and Libya to the northwest. Internally, the Nile divides the country into eastern and western halves.The population of Sudan are descendants of migrants from the Arabian Peninsula. The overwhelming majority of the population today adhere to Islam.